Who would have thought that the most interesting thing to come out of Apple's "Spring Forward" event would actually be a new laptop? In addition to spilling more details on its new smartwatch, the company also unveiled a brand-new (and long-awaited) update to the MacBook Air. Well, sort of. The "new MacBook," as it's called isn't actually an upgrade to the Air at all; it exists as an entirely new product line, separate from both the Air and the Pro. At $1,299, it won't be cheap, but it's for people who demand the thinnest and lightest possible design from Apple, without having to compromise on the screen quality (as you normally would when you buy an Air). I had the opportunity to get hands-on after today's event, and came away impressed -- not just with its fanless design, but with the Retina display, pressure-sensitive trackpad and redesigned keyboard. That said, it's not for everyone. It clearly shares the same DNA as its stablemates, but it's ever so much lighter than the Air. 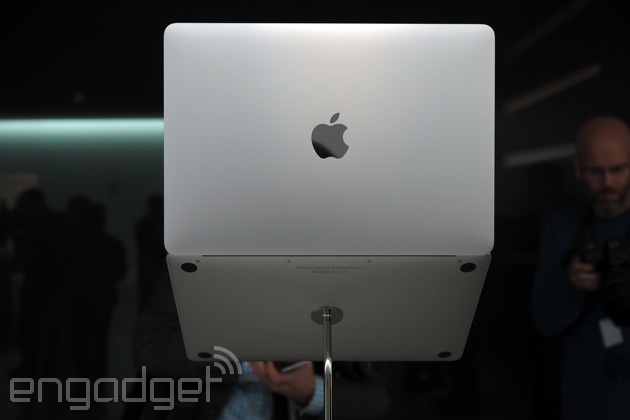 You'd be forgiven if you thought the new MacBook was a replacement to the current Air. This new machine has a similar aesthetic, with a unibody aluminum chassis, available in three colors; black keys; and a wedge-shaped profile. It also has a stunning 12-inch 2,304 x 1,440 Retina display that's equal to all the other Retina displays in quality, if not actual resolution. In other words, it clearly shares the same DNA as its stablemates. But man, is it ever so much lighter than the Air. At two pounds, it makes the Air (which I'm using to type this) feel like a heavy, old thing. I actually feel a bit bummed I'm using this instead. At this weight, too, it's nearly as light as the "world's lightest laptop" that Lenovo showed off at CES, except the build quality is far superior here. Apple was able to get the weight down without having to resort to cheap-feeling materials. That alone is no small feat. To achieve this thinness -- just 13.1mm at its thickest point -- Apple had to redesign the keyboard you would normally find on the Air. This was a serious gamble on Apple's part: The Air's springy, well-spaced keyboard is one of the reasons many people prefer it over rival machines. Indeed, I actually cringed a bit when I first saw the new MacBook's button layout: The keys here really don't have much travel. Given that I review Ultrabooks for a living, and am so often tasked with testing shallow keyboards, I almost instinctively cocked my hands a certain way; I was prepared for a keyboard that wouldn't offer much resistance under heavy typing. It turns out, I just needed to give it a chance -- and learn to trust the machine, which admittedly takes time. Though the backlit buttons are indeed flat, and while they aren't cushy, they are still springy. They pop back up when I hit them. That means I can type at a gingerly pace and know that for the most part, I won't miss a key, and that most of my button presses will register. If this were another machine, I might unconsciously start mashing the buttons, just to make sure I don't have to go back and re-type anything. I was prepared to do that here, but quickly felt my hands relax once I realized they didn't actually need to work that hard. Again, though, there could still be a learning curve for those of you upgrading from an older MacBook. The trackpad has also received an update. Don't worry, it's still a spacious glass surface, and it still excels at all the basic stuff, like single-finger tracking and two-finger scrolling. But it's now pressure-sensitive too, which opens up possibilities for lots of new gestures, even beyond the ones you already know. For instance, I can press and hold my finger down over an address in Mail, only to see a map pop up. I can do the same in Safari as a way of getting a Wikipedia summary. It also works in Finder, allowing me to preview files. My favorite, though -- and I imagine the favorite of anyone watching the keynote -- is the ability to fast-forward or rewind extra fast in QuickTime by bearing down on the arrow icons. Throughout, the experience feels very controlled; very deliberate. I can't see how you would accidentally use a Force Touch gesture if you didn't mean to. A light tap on the touchpad means something totally different than a hard press with your finger. Even if you press lightly and keep your finger there, that's not the same as applying real pressure. The machine knows better. It has what I'd call the touchpad equivalent of palm rejection. But back to the thickness. 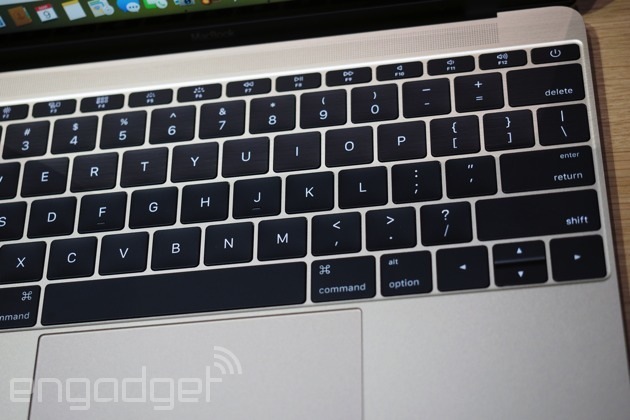 Apple didn't just have to retool the keyboard. 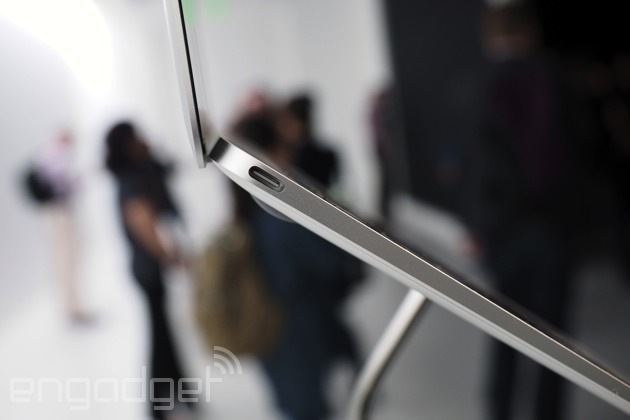 It also had to rethink what kind of ports could even fit on a machine this thin. With this next-gen system, Apple moved to just a reversible USB Type-C port, the same size as a typical micro-USB socket. From there, you can use the port to charge the device, as well as use adapters to make it work with HDMI, VGA and DisplayPorts on other devices. On the one hand, this seems a bit inevitable -- I can tell you now that other PC makers have laptops in the works with USB Type-C ports. On the other hand, there's only one such port here (not even two) and also, that kind of port is hardly ubiquitous yet. For people used to plugging in full-sized USB connectors into their existing laptops, this could be an off-putting change indeed. I know I'm not used to it. So will that be a dealbreaker? For some people, yes. It depends on how much you need that Retina display -- and that two-pound design. The regular Air might still offer even longer battery life, not to mention all the ports you need. But it weighs more, and the screen is far inferior to the one here. Meanwhile, if you wanted this kind of screen quality (and all the usual ports), you'd have to step up to the MacBook Pro with Retina display, which is obviously much heavier. For Mac diehards, then, that leaves little choice if portability and screen quality are important. For the more OS-agnostic among you, though, the decision could be tougher. We've seen some very thin, lightweight Windows machines and some of them, like the Dell XPS 13, even make do with more powerful processors than the low-power Intel Core M chip used here. And yes, they have all the usual ports, too. That's something to keep in mind as you're shopping -- and for me to remember when I eventually write my full review. Will you get the new MacBook?